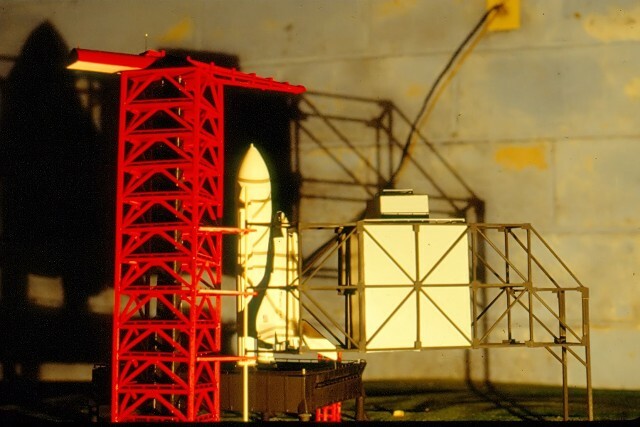 This is a model which began back in 1977, as an attempt to create a basic "model rocketry" oriented display stand for my 1/162 Estes flying Space Shuttle model. I was driven by pictures taken on our recent vacation trip of the Shuttle launch pad construction at LC 39A in Florida, along withe pictures of a pad display model seen at the U.S. Space & Rocket Center in Alabama. 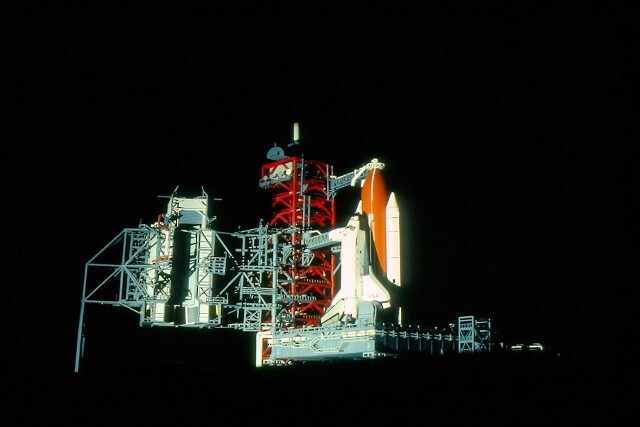 Enterprise had not yet gone to KSC to conduct the Facility Verification Test, which would not occur until mid-1979, so the "actual" look of the Shuttle support structures was not available yet. All I knew is that that basic model looked pretty good. Along the way, our club back then, the Illinois Valley Aerospace Club, decided it was going to raise money and take its members to the first Space Shuttle launch, which was supposed to be in 1979, but that became 1980, which became 1981. 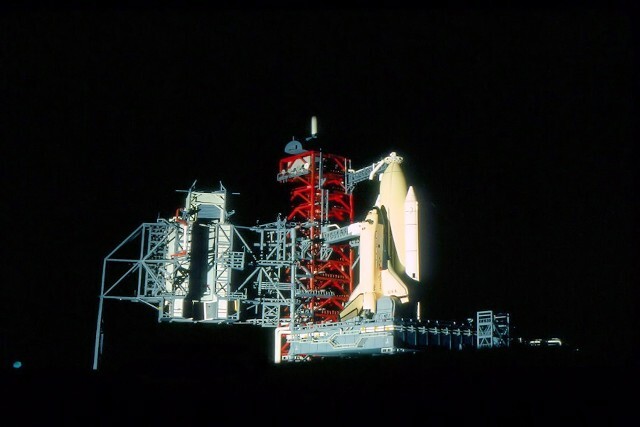 In December of 1980, STS-1 rolled-out to the launch pad to begin preparations for an on-pad Flight Readiness Firing of its three Shuttle Main Engines, and then final preparation for powered flight. The roll out was covered by all the major news magazines, and I finally had some better visual data to re-make the model withe, but not enough to make it worthwhile to start now. My hope was to have pictures from our launch trip to work with. Boy, did I get them. Our group ended up at the Kennedy Space Center Visitors Complex on Thursday, April 9, 1981, and we pushed to get one of the last KSC Tours running that day in hopes of seeing Columbia on the pad. Once on -board our bus, the excitement was tangible. Everyone, of course, was there for the same reason. The bus stopped near the Crawler-Transporter parking location along the Crawlerway, midway between the VAB and Pad A. We were allowed to get off and take photos. I figured this would be it, so I tried to use as long a lens as I could, but it's still 1-1/2 miles to the pad from there. Then, it was back on the bus. I thought we'd be going back to Visitor Complex or somewhere else, but we continued to drive towards Pad A, and we just kept on going, right up to the base of the pad incline, where Perimeter Road breaks off from the Crawlerway to run around the pad in a octagonal-shaped pattern. Our tour bus made a slow orbit on Perimeter Road, completely around Pad A, withe Columbia exposed; the Rotating Service Structure rolled back and ready to fly. During that part of the tour, I ran through over 72 35mm photos, getting all of the pad data I could get. Besides, there would never be another "first flight," so I wanted to remember it well. The launch of STS-1 is now history. 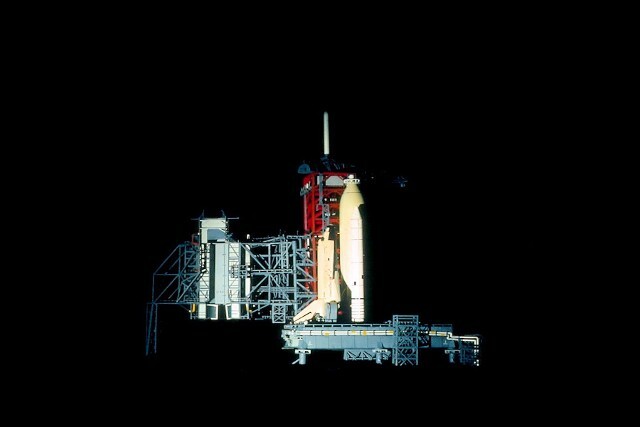 The first attempt on Friday, April 10 ended at 11:00 AM, after a second attempt to re-set the programming of the General Purpose Computers failed, and the flight crew had exceeded their allowed time on their backs prior to flight. The problem was analyzed and fixed on the 11th and the count recycled. On Sunday, April 12, 1981 at 7:00 AM, STS-1 rose majestically from the pad in a triumphantly successful flight, and we were privileged enough to have been there, standing along the shores of the NASA Causeway to see it go. Much later, I recalled that it was 20 years to the day that Gagarin made the first human flight into orbit. Look how far we've come in 20 years! Upon returning home, I acquired my first accurate scale model of the Shuttle stack - an Airfix 1/144 scale plastic kit, and got to work building a visual duplicate of the STS-1 vehicle. As I was working on the bird, I really began to look at that old pad model. The 1/162 scale of the Estes model was not that far from 1/144 scale, and all the dimensions I used were "a guess" at best, as I had no real scale references to work with. I just built it to "fit" the model. Using the Airfix Shuttle as the "scale reference," I began to examine the pad parts and found the tower section (Fixed Service Structure) so close to the required dimensions that only minor overall modifications would be required. However, the Rotating Service Structure would become a completely new build. That's how the transformation started. Section by section, part by part, measured against the Shuttle to verify scale sizing, the parts were all hand-fabricated of paper, balsa wood, plastic and lots of other stuff. I worked as close to the detail available in the pictures as I could. As all of the pictures were 35mm slides. I had to project them onto a screen and do the scale measurements from the projected image. 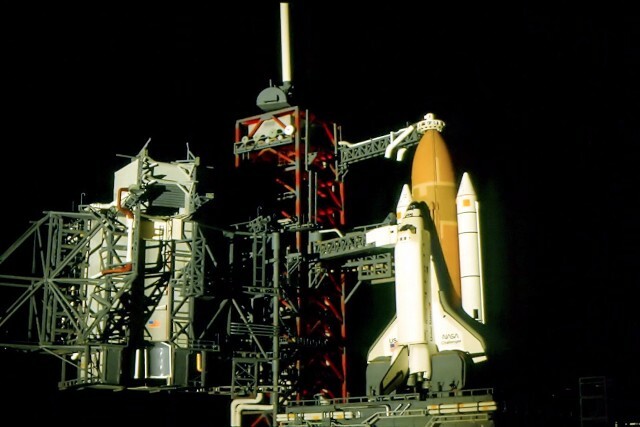 The original STS-1 incarnation of the Launch Complex 39A model was "completed" during 1982. When we got back from the launch of STS-4 in June of1982, I did another Airfix model in that detail scheme. Then, when Challenger joined the fleet in 1983, I got "rev'ed up" again and built up a Revell 1/144 scale Shuttle stack to look like STS-6, with Challenger, her new "light weight" External Tank and revised SRB nose cone markings. Along the way, the complex model was also revised and improved. I took some outdoor pictures of the model, in an attempt to get a really dark night sky backdrop, using portable lamps as spotlights to illuminate the model. The results were good enough that I decided to send copies to Revell, to show them what their model could look like with a realistic setting. Weeks later, I received a letter from Mr. Sean Day of Revell in California, discussing the possibility of Revell "borrowing" my model to use as a showcase piece, representing an upcoming production model kit of the Shuttle Launch Complex that Revell and its partner company in Germany, Cieji, were intending to make and sell. My model would let them display now at the Dallas Hobby Exposition, as well as the New York Toy Fair, the largest toy and hobby show in the US. Wow! This was unexpected! After a bit of correspondence back and forth, the deal was set. Revell sent out two large and very strong fiberglass "anvil cases" and a boat-load of soft foam sections, so that I could pack the model for shipment. I made complete foam surrounds for the RSS-FSS portion, which could be removed from the display platform (I had planned ahead on this one). 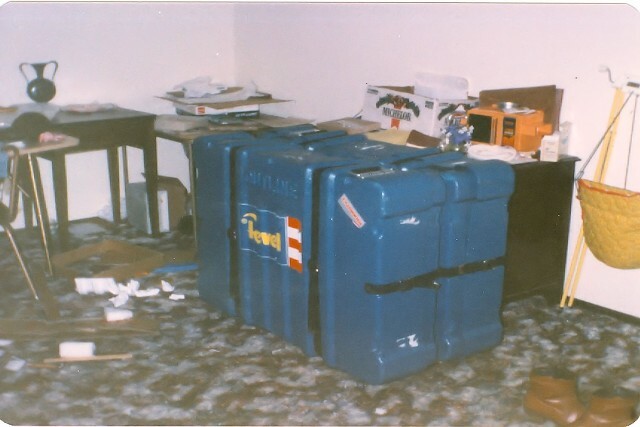 The platform itself went into the other case. After a call to Fed Ex for pick-up, the model was on its way. Revell photographed the model to use a "baseline" reference of their own, displayed it in Dallas, displayed it in New York, and then requested more time before returning the model. 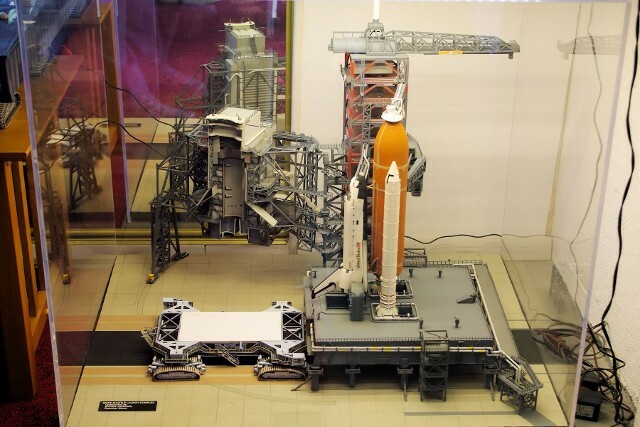 There were discussions on the table to stage a formal product release event at the Kennedy Space Center's "Space Store," as the store is obviously a large Revell customer. The locale was certainly appropriate, and the event could be coordinated with the upcoming "Teacher in Space" mission, which was assumed to bring a large number of visitors to the area. From my chair, that was fine, as long as I could go and stand with my model while it was on display there. Revell tentatively agreed, but the deal was not set in stone. Time would tell. Initial production of the Revell-Ceiji Shuttle Complex model ran into as many delays as the real Space Shuttle. Differences between Revell and Cieji over detail content, price, packaging and other issues, drove the production date well into 1987, at best. The Teacher in Space flight was set for January of 1986. Plus, with all the "revisions" being forced by Cieji, Sean and Revell were not as satisfied with the product's accuracy as they wanted to be. Ceiji wanted to maintain the use of their smaller display-version of the Mobile Launch Platform and save the cost of re-tooling the molds. Although Revell California knew the model would still sell, with the "semi-scale launch platform," it was not going to be as accurate as it should be. So, the Florida trip did not occur. I was very disappointed, until the morning of January 27, 1986, when the Teacher in Space Mission, Flight 51-L, exploded 73 seconds into powered flight. After the initial shock of watching it on TV, I realized that if things "had" gone differently, I would have been there when it happened, and the model's debut would always have been surrounded by that event. My model returned home. There was substantial damage to it from all the moving around; more that Revell wanted to discuss openly on the phone. They did, however, provide a large number of specialized parts and supplies which allowed me not only to repair, but to improve the model. 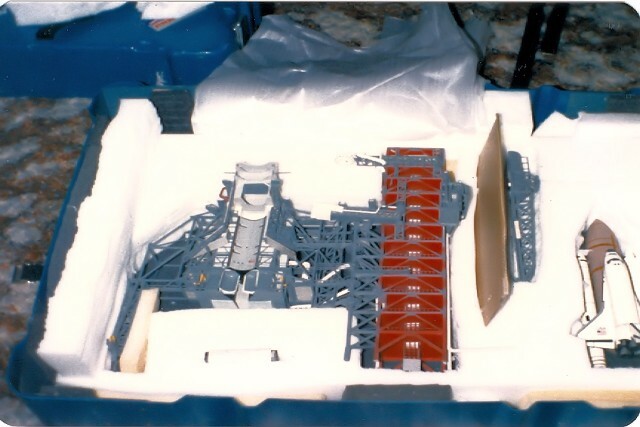 They sent sets of handrails and stairs from a Cieji 1/144 scale model of an off-shore oil platform, as well as sheets of clean Grey styrene to re-fabricate with, rather than paper. They also agreed to send me copies of the production model when it was available, as well as funded a Plexiglas enclosure to protect the original, which was fabricated by a local plastics shop. 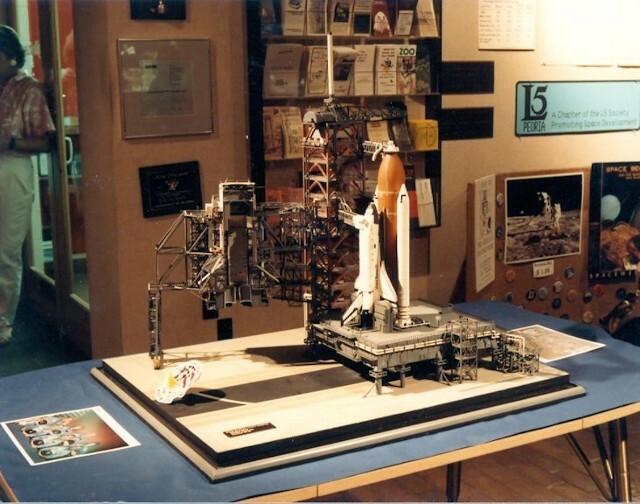 The repaired and revised Launch Complex 39 model would become the centerpiece of the IVAC's SpaceWeek 86 activities at the Lakeview Museum in Peoria, Illinois in July of 1986, which was dedicated to the memory of the Challenger crew. My model held a Revell 1/44 scale Shuttle stack, detailed as Mission 51-L, with a NASA crew photo and mission patch, acting as a memorial to the crew and the continuing dream of spaceflight. 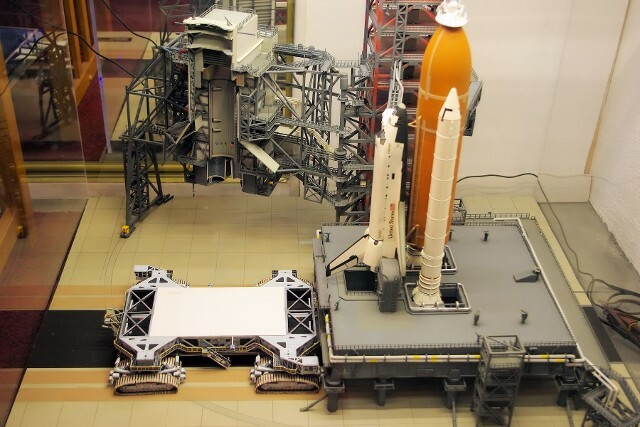 The model remains with me still, virtually unchanged after the 1986 work, with one exception - the recent addition of a 1/144 scale EduCraft Shuttle-era Crawler-Transporter. It sits just beyond the "south" edge of the MLP, appearing to have just left the stack on the pad. 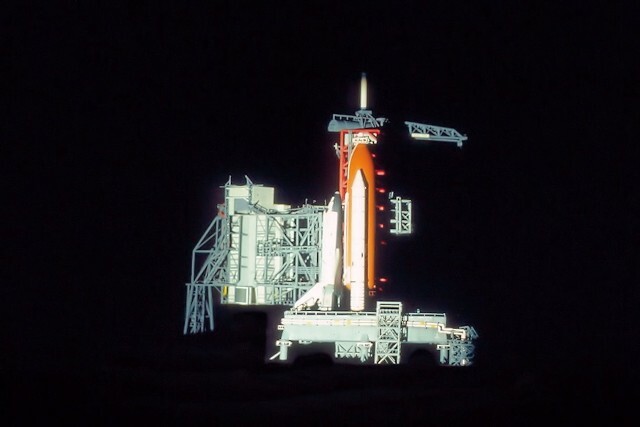 The model still shows the Shuttle early in its program career. A place I wish to keep it. That way, I could still put the Airfix STS-1 model back on it, and it would still look appropriate. All modelers know that some works are special, but other projects can only be classified as an "obsessions." The LC39 model became my obsession. An obsession originally to retain the view of that first Shuttle launch back in 1981, and then to recall the point where our technical "innocence" was taken away from us in 1986. In spaceflight, there may never be an "operational" state. It is, and continues to be, a very dangerous business. 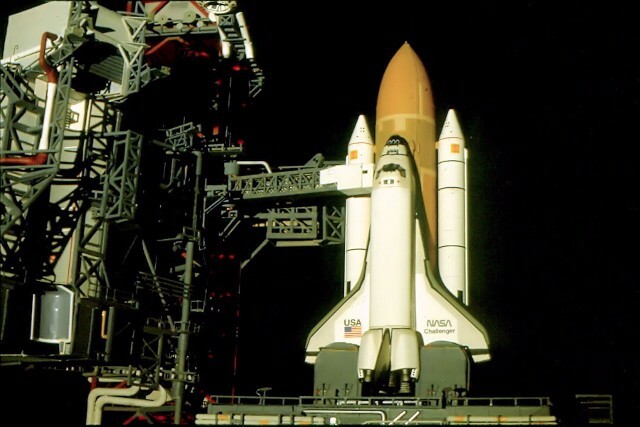 But the Space Shuttle, more than any vehicle before, gave some of us the first real hope that spaceflight would eventually be "deprovintiallized, " allowing private citizens the opportunity to fly into orbit someday. Some actually did, like Senator Jake Garn, Charlie Walker of McDonnell-Douglas, and lastly, Greg Jarvis from RCA and school teacher Christa McCaullife, who died aboard Challenger. I miss seeing the Shuttles fly. But in reality, that dream of private spaceflight may be closer now than at any time during the Shuttle Program, as NASA has passed the torch of orbital personnel transport to private enterprise. But the Shuttle and I grew up, and grew old together, so this model is now a testament to a very important and cherished time of my life. 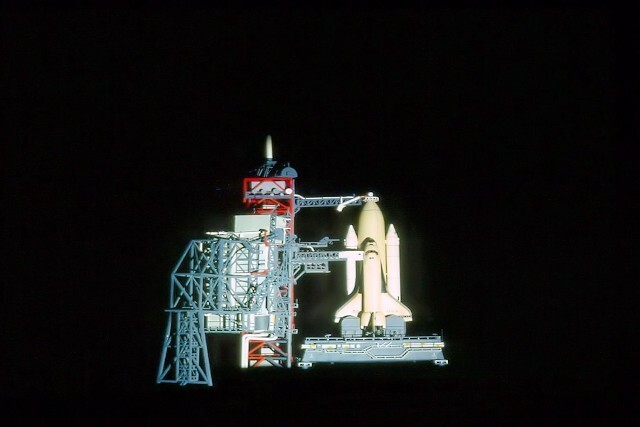 Photo of original "schematic pad system" display model with Estes 1/162 Shuttle standing on it. 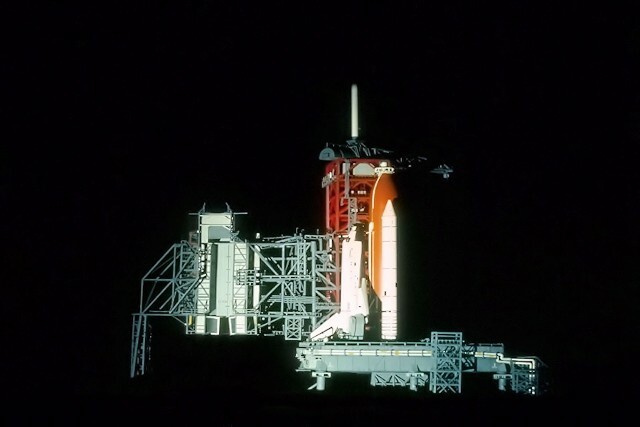 Simulated night-time shot of the original "schematic pad system" display model with Estes 1/162 Shuttle standing on it. 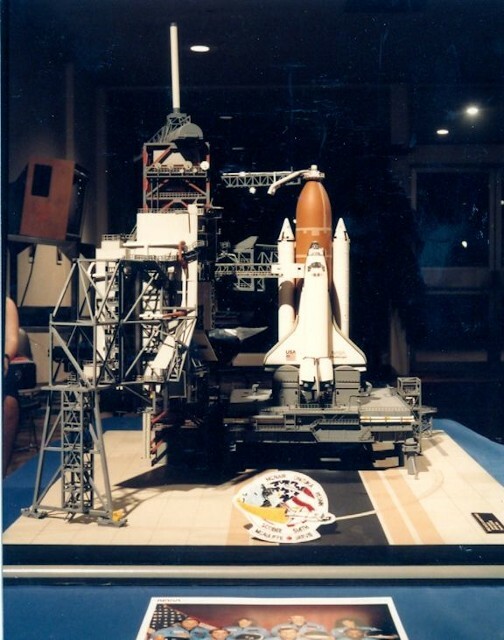 Photo of revised 1/144 scale launch complex model with the Airfix "STS-1" model stacked on it in. 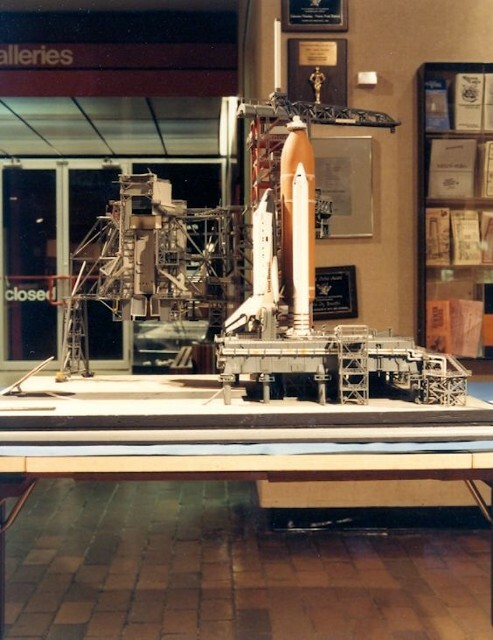 The launch complex model is here shown with a second Airfix 1/144 scale Shuttle System, detailed as STS-4, fourth flight of Columbia and second Shuttle launch we witnessed at KSC in June, 1982. 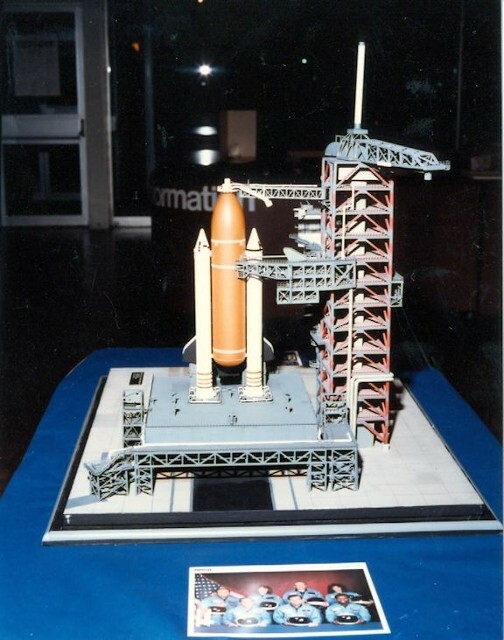 The launch complex model supporting a Revell 1/144 scale Shuttle stack, detailed as STS-6, the first flight of Orbiter Challenger, in 1983. The first of two special shipping cases sent by Revell Corporation to send the model to them of imaging and display at the Dallas and New York Hobby Expositions. 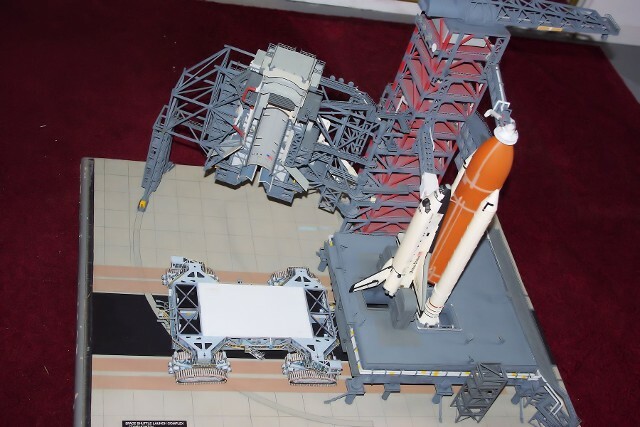 This case holds the FSS-RSS complex, the hammerhead crane and the Revell Shuttle Challenger. 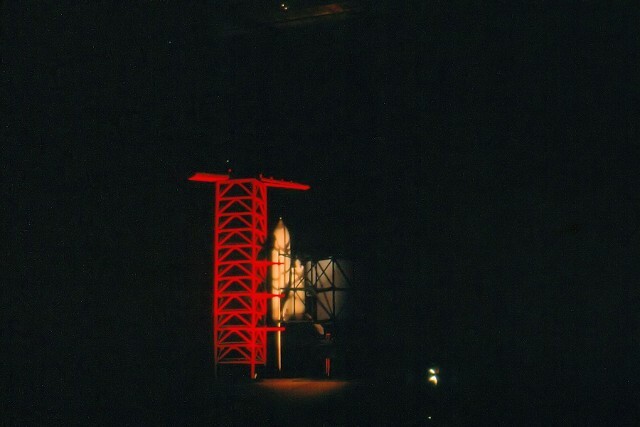 The second case held the main platform, to which the Mobile Launch Platform, its support pedestals, the north pad connection structure and the location sockets for the RSS. The deck is painted to replicate the concrete surface of Launch Pad 39. Packed and ready for departure. Mr. Sean Day of Revell took this picture for me of the Revell display at the 1984 Dallas Hobby Exposition. I was proud to see my LC 39 model so prominently displayed. The returned, repaired and revised LC39 model as it appeared at the IVAC-L5 Society SpaceWeek 86 events at Lakeview Museum in Peoria, IL. 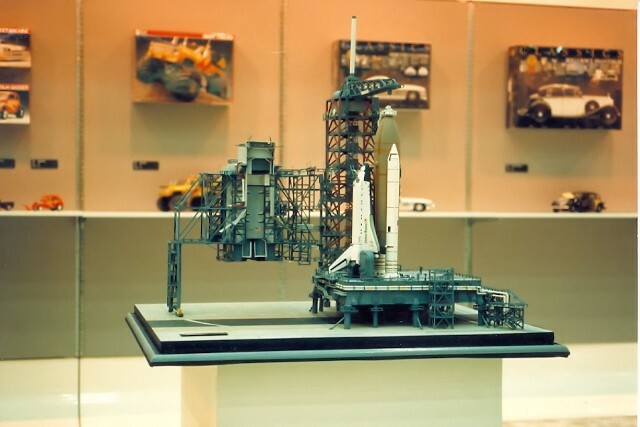 The display featured a Revell stack detailed as STS 51-L, as a memorial to the Challenger Seven astronauts. The crew photo an mission patch are seen in th front. The LC 39 model as it exists today. Challenger still rests on the MLP. The Crawler-Transporter has just brought the stack out to the pad from the VAB. The Crawler model is made by EduCraft Diversions. The Plexiglas enclosure sits off to the left. 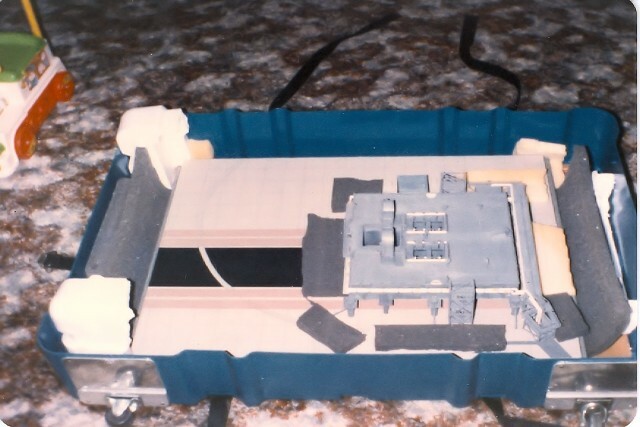 Here is the one, single example of the actual Revell Germany production Launch Complex 39 model I ever built. It is residing in the lobby of the Dome Planetarium of the Peoria Riverfront Museum on Peoria, Illinois, my old home town. I donated the model to my old friend, Mr. Sheldon Scheaffer, who was Planetarium Director at Lakeview Museum in Peoria (precursor to Riverfront) for 38 years. I helped Sheldon with a large number of space-related activities and exhibits at the Museum during my years in Peoria. The model still stands, along with commemorative patches of Mission 51-L (the loss of Challenger), STS-26 (the return to flight after 51-L) and STS-125 - the last repair mission to the Hubble Space Telescope, which was commanded by Navy Captain Scott Altman, a Peoria native son. 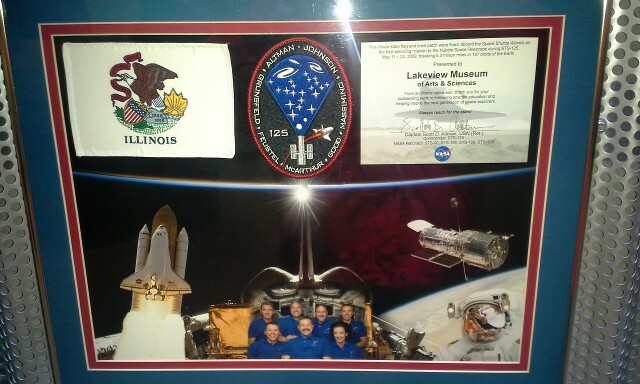 An STS-125 Flown-Flag plaque now resides near the pad model as well. 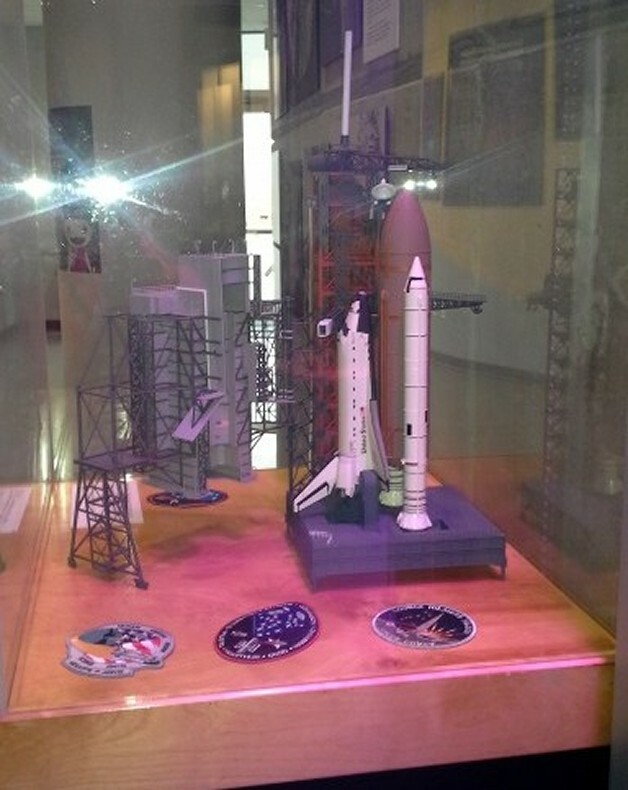 It always makes me proud to visit the Museum and see my work still on display there, as a reminder of the great days of the Space Shuttle Program.